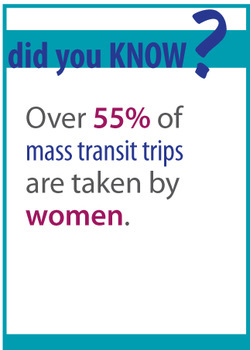 Public transportation is a highly used public commodity in Wisconsin and an important transportation alternative for many women and families who cannot afford to purchase or maintain an automobile, or who wish to reduce their dependence on automobiles for lifestyle or environmental reasons. Public transportation in Wisconsin includes: commuter/regional buses, intercity buses, rail lines, ferry, and airports (with passenger service). According to the Wisconsin Department of Transportation, Wisconsinites took over 79 million trips in 2013 using public transit. Approximately 48% of Wisconsin public transit riders use the service to get to work; 23% for education purposes; 18% for retail, tourism or recreational destinations; and 11% use it for medical purposes. Public transportation offers a cost-effective and environmentally cleaner way of commuting than individual car ownership. A study conducted in 2002, and updated in 2004, shows that public transportation in Wisconsin saves Wisconsin riders and taxpayers an estimated $730.2 million annually. Additionally, a Department of Transportation study found that for every $1 invested in public transit there is an over $3 return. The budget proposes a modest funding increase of $438,000 over the biennium (a one percent annual increase) for the County Elderly and Disabled Transportation Assistance program, which provides counties with financial assistance to provide transportation services to adults over the age of 65 and people with disabilities. If enacted, total annual funding for the program would be $13,915,600 for 2016-2017. The Governor’s budget also fully funds the 4 percent increase for mass transit aids to local governments that was approved in the 2013-15 budget and scheduled to take effect in 2015. The one-time funding increase will provide an additional $3.2 million for the program in calendar year 2015. No additional funding increase would be provided for mass transit operating assistance in calendar years 2016 and 2017. In order to put this one-time increase in perspective, one must consider that total funding provided for mass transit operating assistance over the past eight years and the two years of the upcoming biennium 2015 state transit aid to local governments remains below the 2009 aid levels, largely due to a nearly $12 million cut to aids in 2012. These cuts were partially offset by a program that funds local paratransit needs that was created in the 2011-2013 budget. In addition the funding increases mentioned above, the proposed budget also repeals or cuts existing transit programs. The budget would repeal Wisconsin’s “Complete Streets” law, which requires that bicyclists and pedestrians be taken into account whenever a road is built or reconstructed with state or federal funds. The law contains exceptions if accommodating bicyclists and pedestrians would be cost prohibitive or bike and pedestrian traffic is too light. The budget also cuts all state funding for the Transportation Alternatives Program (TAP), which amounts to a $2 million total cut. As a result, the program would only receive federal support, which totals approximately $7 million annually. Currently, state TAP funding can be used to fund bicycle and pedestrian projects, while federal TAP funding can be used for a broad range of transportation-related activities, including construction and planning of nontraditional transportation improvements such as on-road and off-road bicycle, non-motorized vehicle, and pedestrian facilities. In addition to provisions that directly affect transit programs, the budget also proposes approximately $1.3 billion in bonding to pay for highway projects. Such significant borrowing to pay for highways demonstrates that the state still greatly prioritizes building and maintaining roads over funding other long-term transportation solutions that would reduce Wisconsinites’ reliance on automobiles and help protect the environment. The Joint Finance Committee did not make changes to the Governor’s proposals on mass transit. The committee also maintained the Governor’s proposal to eliminate Wisconsin’s Complete Streets law, as well as his proposed cuts to the transportation alternatives program (TAP). For more information about the changes that the committee made to Complete Streets and TAP, check out this article from the Wisconsin Bike Federation. The Legislature largely approved of the public transit budget as amended by the Joint Committee on Finance. People with disabilities and older adults often rely on transit programs to get to their medical appointments, jobs and live independently (see the section on Family Care for more information regarding how both of these populations, and their caretakers, are disproportionately women). As a result, the modest increase in the County Elderly and Disabled Transportation Assistance Program is a welcome improvement for the people affected by this program. The one-time increase in state mass transit aids to local government is also a welcome change, but it is unfortunately a one-time expenditure. It remains unclear whether the overall health of Wisconsin’s transit system will be improved after the budget is enacted. This is problematic both for Wisconsin’s environment and for the quality of life for citizens who rely on public transit in their daily lives.